Sit back folks, I’m feeling chatty! I have a little chickpea-centric story for y’all today, and I 110% understand if you want to scroll right on down to the recipe. In fact, I’ll make things easy peasy and slap the recipe right here at the top of the post, and if you want to partake in our daily dose of craziness, scroll down for the goods. Though it looks like it’s straight out of a gourmet bistro, this simple (and speedy) salad is easily thrown together with just a few flavorful ingredients at home! Snag your go to pre-made dressing or try my homemade poppyseed ranch! Oh and I’m totally awarding bonus points to anyone who adds extra veggies to their bowl. Scratch and sniff cupcake stickers for all of you! Ranch dressing always tastes it’s absolute best made ahead of time. Whisk and chill for a few hours before serving or make things simple by tossing it together the night before. Peel 1 clove of garlic, then smash and mince it into a paste. Combine salted garlic paste with remaining dressing ingredients and whisk well. Pop in the fridge to chill for a few hours for flavors to set. 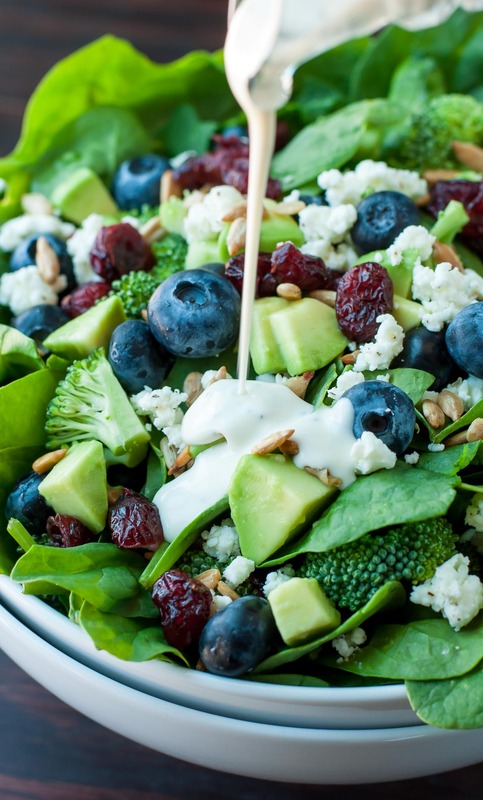 Combine with broccoli, blueberries, dried cranberries, avocado, feta cheese, and sunflower seeds. Season with black pepper, to taste. This dressing works with both fresh and dried herbs, so absolutely use what fresh herbs you have on hand. I’ll include measurements for dried, which are a little stronger in flavor, so when using fresh you’ll simply increase the amount to taste. Enjoy! Making more dressing for later? Typical food safety rule of thumb is that homemade dressings will keep in the fridge for 4 days. Nutrition facts below are an estimate provided by an online nutrition calculator. Values calculated for the salad pre-dressing. Add dressing to taste and adjust as needed. I used a feta made of goat and sheep’s milk, but you can also use straight up goat cheese or cow’s milk feta. Need to make this dairy-free? I gotcha! Skip the cheese, sub your favorite dairy-free dressing (this fruity blueberry balsamic is amazing!) and treat yourself with some tasty candied walnuts in place of the cheese. No blueberries? Try strawberries, raspberries, or even chopped apple as a fruity sub. I adore sunflowers in this salad, but pepitas would be great too! 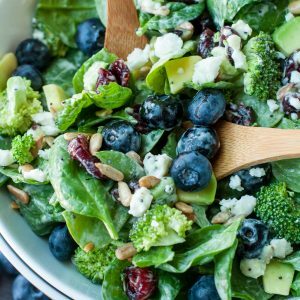 Feel free to customize this Blueberry Broccoli Spinach Salad with all your favorite salad mix-ins and I’d love it if you stopped by and told me what tasty extras rocked your socks! Not surprisingly, recipes are a hot topic of conversation around here. Whether I’m brainstorming for a week’s worth of meals with the pilot, recipe developing for the blog, testing said recipes, jotting down random ideas in my handy dandy notebook, or writing up my completed masterpieces for the blog… recipes are kind of my thing. As a result, Mia has become OBSESSED with the idea of recipes. This kid LOVES creating recipes. Her version of a recipe, is a little list of what she can expect from the day. Her “recipes” typically include things like meals, naps, play dates, outings + activities, baths, story time, and sleep. Let us pause why I laugh maniacally over the inclusion of naps in her lists. Right. We should add unicorn riding to the recipe while we’re at it ? Also, I just shouted “Where’s my unicorn emoji? !” to Paul and Mia legit just handed me a stuffed unicorn. Well played, chickpea. Each day around here is drastically different, thanks to my erratic schedule and the craziness that comes with having a flight instructor for a daddy. His work/home schedule changes daily and will flip flop from working all night and sleeping all day to extra-long day shifts that often result in a certain tot staying up past her bedtime to catch a glimpse of her marine. To help us make each day feel a bit more routine for our nugget, started doing a little morning game plan for the day, based on the location of our favorite pilot, my work/play schedule, and rotating errands, playdates and such. She’s taken to calling them her recipes and it wasn’t long before she began creating her own for the day. I think they’re her way of and finding her calm making sense of our inability to grasp a set routine… It wholeheartedly kicks me in the feels. I love that crazy kid and all the recipes we create together. This concludes my hormone-induced cheesiness for the day. I flipping LOVE this salad! In a hurry? 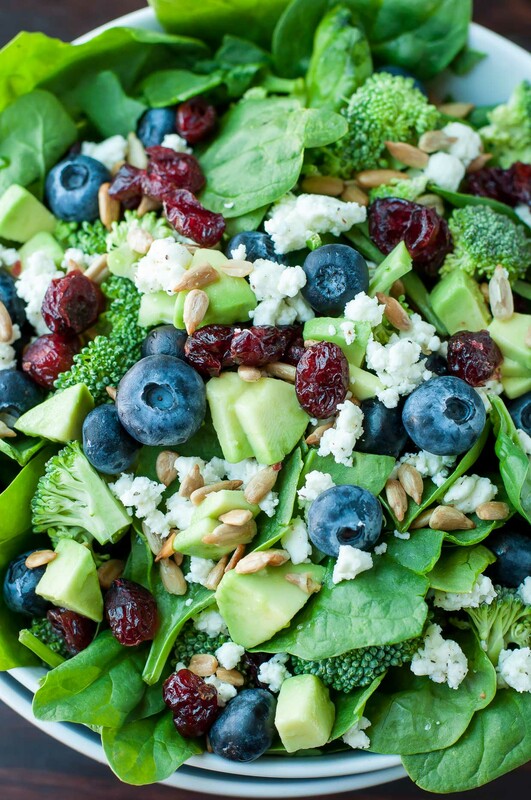 CLICK HERE to pin in this Blueberry Broccoli Spinach Salad for later! Loving this sassy spinach salad? Try my Almond Crusted Goat Cheese Salad with Strawberries and Kiwi or Spring Mix Salad with Blueberry Balsamic Dressing next! Made this for family get together over the weekend and loved it! Rave reviews from friends and family. Definitely making this again! Ohmygoooosh I want to live in your kitchen! That sounds awesome Robin, thanks! Has anyone tried substituting plain Greek yogurt for the mayonnaise? Hi thanks for great salad ideas! Do u think grated parmesan instead of feta would work with the blueberry broccoli spinach salad ? Hey Angela! I think grated parmesan might be odd with the dressing and broccoli. I like parmesan with cooked broccoli but crunchy raw broccoli salads with a mayo based dressing would have me leaning towards feta or maybe even coarsely grated or cubed white cheddar cheese. If you only have parm handy maybe just go cheese free? Or try it on just a forkful and see what you think! Hope this helps and that you get a chance to try the salad! We are going blueberry picking – for the first time – this coming weekend and I will be making this for sure. Delicious! I love the blueberries in this! I would have never thought to add them to a broccoli salad! Wow does this look fabulous! 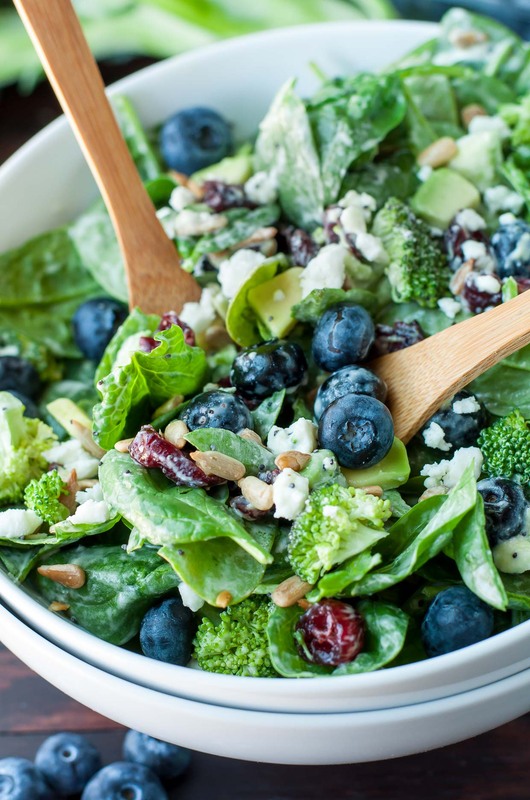 I’m pretty sure I’ve never had blueberries in salad before but it’s a great idea! Putting this on my menu for the week. I love that you give us dairy free options too. We are lucky we can have goat cheese as you suggest. Can’t wait to try this salad. I love blueberries (and strawberries, for that matter) in salads! In fact, this salad makes me really long even more than I already was for blueberry season. Beautiful – and the feta makes it even more yummy sounding! Ohmygosh I am counting the days til blueberry season starts here! SO CLOSE!!! Thanks Ali! I make so many spinach salads but I’ve never thought of adding broccoli before – love it! Will definitely make this next time! 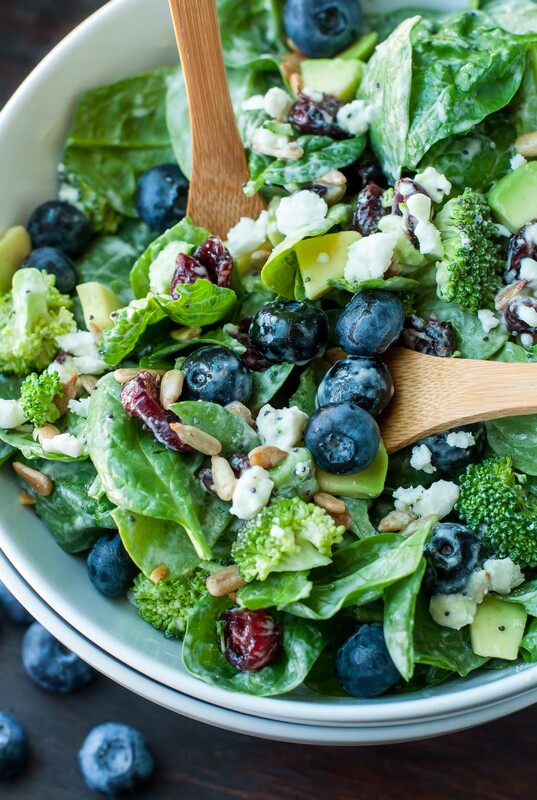 Love the idea of putting blueberries in a salad. It sounds delicious. I’m pretty sure my little guy would pinch all the blueberries though! LOL! 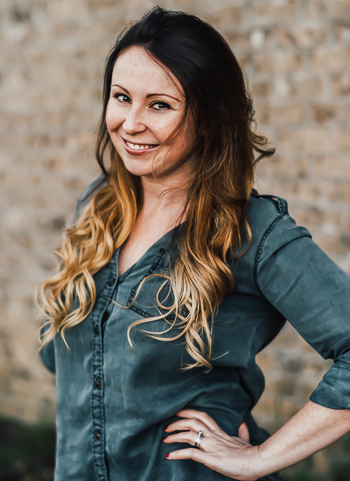 Thanks Cristie – hope you get a chance to try it! Love the cuteness and the “recipe making”! So adorable! I also really like the idea of a blueberry and spinach salad, always see strawberries and spinach, but this sounds even better! Thanks Sarah! Strawberry salads are also a favorite here too but oh man these blueberries! Love them so! I guess I was hoping this salad would be more like the pre-made broccoli, cran, nut, poppyseed salads you can pick up at the store. I think it’s too rich with a ranch/milk based dressing. Not making again. Hey Julie! I haven’t tried the store variety you speak of but I’m sorry my dressing pairing wasn’t what you were used to! Many fruit and spinach salads like this tend to have a sugar based poppy seed dressing and I was craving something a little different. I personally adore the ranch here but I completely understand that we all have different taste preferences. I absolutely loved it. Didn’t think I would and was surprised by how much I loved it. Didn’t have sunflower seeds so I substituted walnuts. Amazing. This looks like the best ever combination of healthy and tastefull dish! Everything you added to this salad I have right now. That is rare and exciting. LOl , Thank you for posting. After all the holiday foods I am ready to be healthy again. Funny how it sneaks up on us. Love the salad. Love the dressing. I just don’t love them together. But I’d make them both again, separately. Hey Lauren! 🙂 So sorry they weren’t pure magic together for ya but I’m super glad you loved both the dressing and the salad respectively! For sure give my blueberry balsamic dressing a try next time you whip up the salad or even try a super basic citrus vinaigrette maybe if you prefer? Hope you find a pairing for each that rocks your socks off! Thank you Cathy! I’m thrilled y’all enjoyed it! 🙂 5 salads a week is an awesome habit – so impressive! This recipe is delicious. My son requests it often! Any suggestions for substituting something else for the avocado? I think, sometimes, the objection to avocado is the mouth-feel. If this is the case, Michelle could move the avocado to the dressing and process in a blender or food processor. That way she still gets the healthy benefit of the avocado. BTW, I made this salad for dinner and loved it. I made this salad for a baby shower and it was a huge hit. So fresh and light tasting. I served it in addition to Chicken Salad on Croissants, a pasta salad, fruit salad and Sparkling Peach Punch. Before the end of the shower I was sharing the recipe. Thank you! I made this salad for my client. ..she loved it! Thank you so much! I made this last night and used a lemon poppy seed vinaigrette instead of ranch. It was fabulous!!! I am going to make this a meal by adding chicken for a weekday meal. It’s a keeper! I made this as directed. In my opinion, this salad would be much better served with a vinegrette dressing. YES! I love adding fruit to my salads. Specifically apples or any type of berries. This looks great. And your little one’s recipes 🙂 SO cute.